Transferring funds between your BPI accounts is easy with BPIExpressOnline. All you need is to enroll your BPI accounts and then transfer funds in the "My Portfolio" page of your BPIExpressOnline. For detailed steps for transferring funds between your BPI accounts, please visit my blog post How to Transfer Funds in BPIExpressOnline. If you are yet to enroll your BPI account, please read my post How to Enroll at BPIExpressOnline. There are times that you need to transfer funds to a BPI account that is not yours. Transferring funds to a 3rd party account is not easy because BPIExpressOnline requires enrollment. 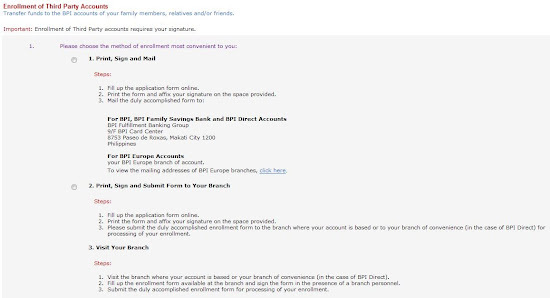 Here are the steps when enrolling 3rd party accounts for BPIExpressOnline transfer. Step 1: To initiate 3rd party account enrollment, go to "My Portfolio" and hover the mouse cursor over the "Funder Transfer" link. Click on the "Enroll Third Party Accounts" link on the drop down menu. Step 2: The next step is selecting the method of enrollment that is most convenient to you. There three methods that you can choose from. These methods are: "Print, Sign and Mail"; "Print, Sign and Submit Form to Your Branch"; and "Visit Your Branch". Please click the image below for a larger view. I selected the "Print, Sign and Submit Form to Your Branch" method in this case. You can select the method that you want by clicking the radio button beside your selected method. Step 3: The next step is that you fill out the details of the 3rd party account enrollment. Please click the image below for a larger view. Select your BPI account that you want to be source of the funds. Type in the joint account indicator (JAI) number. Then you should type in the account name and account number of the 3rd party account. Check if you typed in the correct info then click the "Continue" button. Step 4: Verify the correctness of your data on the "Third Party Funds Transfer Enrollment Form". Click the "Submit & Print" button if you see no error in the form. Please click the image below for a larger view. A confirmation page will appear after you clicked the "Submit & Print" button. Step 5: The last step is submitting the "Third Party Funds Transfer Enrollment Form" to the branch where your BPI account is based. The BPI branch staff will process the enrollment. All you need to do is wait for the 3rd party account to appear to your BPIExpressOnline account. 1. Please take note that only 20 is the maximum number of accounts that can be enrolled in a BPI account number. Meanwhile, 140 is the maximum number of accounts that can be enrolled per client. "Accounts" in this case bills or merchants and government institutions enrolled in bills payment, Express Cash or Express Money Order cards enrolled for reloading, prepaid mobile numbers enrolled in Prepaid Cellphone Reload facility and all third party account enrollments. 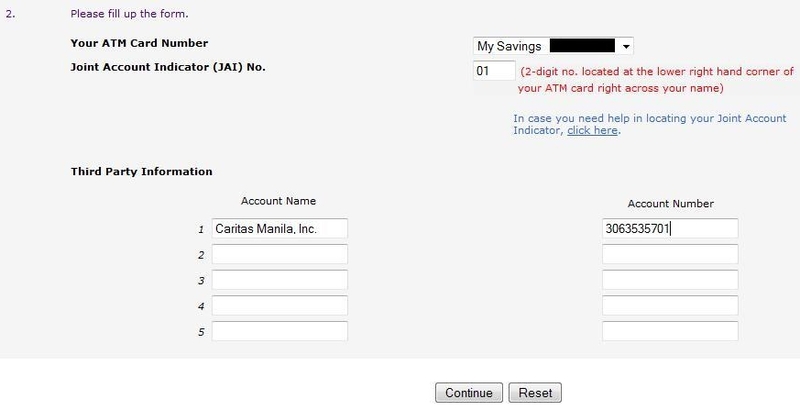 2.The third party accounts that are eligible for BPIExpressOnline fund transfer facility are the following: Express Teller Savings or Checking Accounts (individual account), Passbook Savings Account (individual account), Maxi Accounts for Individuals, Platinum Savings or Platinum for Kids, BPI Direct Savings and Checking Accountd, and Pangarap Savings. Images on this blog post was obtained from BPIExpressOnline.